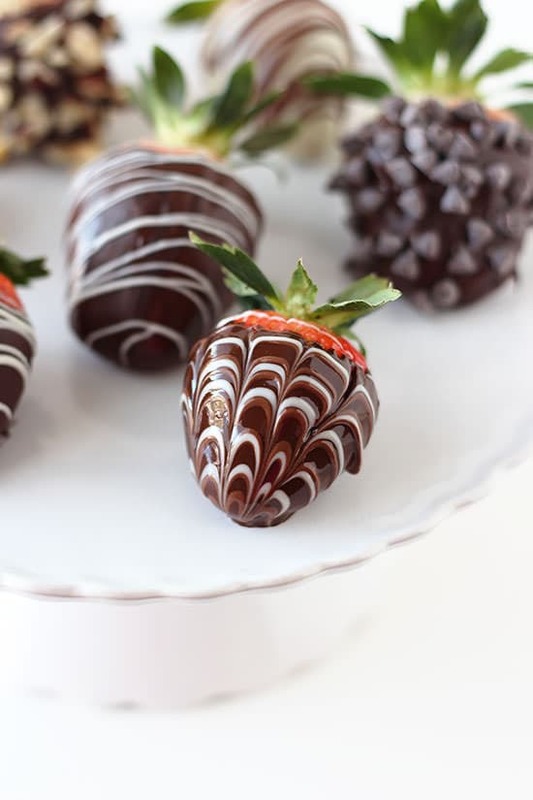 How to Make Chocolate Covered Strawberries with the best tips and tricks! These easy yet gourmet-looking treats are absolutely perfect for Valentine’s Day. Taste: Strawberry and chocolate are a match made in heaven, no doubt about that! Texture: The chocolate is thick and shatters when you bite into it, giving way to a tender and juicy gem of a berry underneath. Ease: Super easy, but if you’re anything like me you may get chocolate on yourself! Appearance: Just stunning. Like something on display at a fancy chocolate shop. Pros: Romantic, simple, and totally customizable. Can be served alone or for a special garnish on cakes or cupcakes. With Valentine’s Day around the corner I thought I’d share a ridiculously fun, simple, yet gourmet treat for you, complete with a step-by-step video! 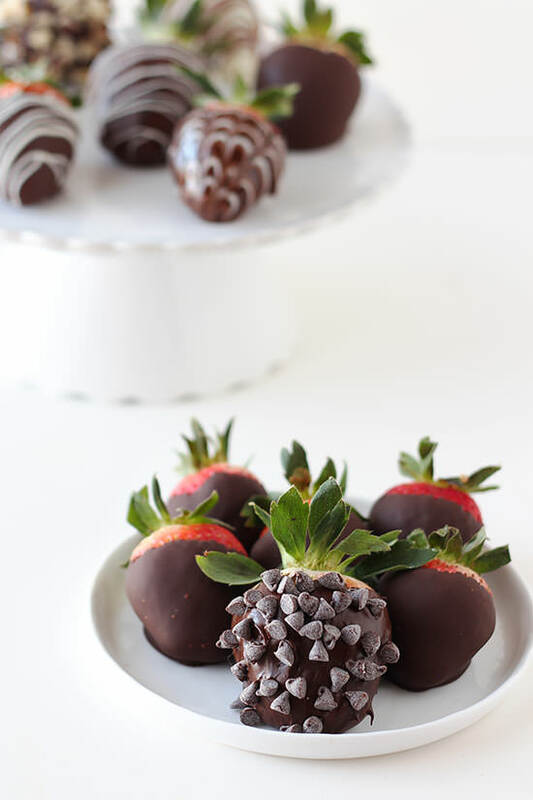 I have a confession: I LOVE chocolate covered strawberries way too much. I could eat a million and still want more. They’re so beautiful and are bursting with some of my favorite flavors and textures, each bite is pure magic! There’s no reason to spend an arm and a leg on chocolate covered strawberries from a bakery or delivery service when they’re surprisingly easy to make from scratch right at home. 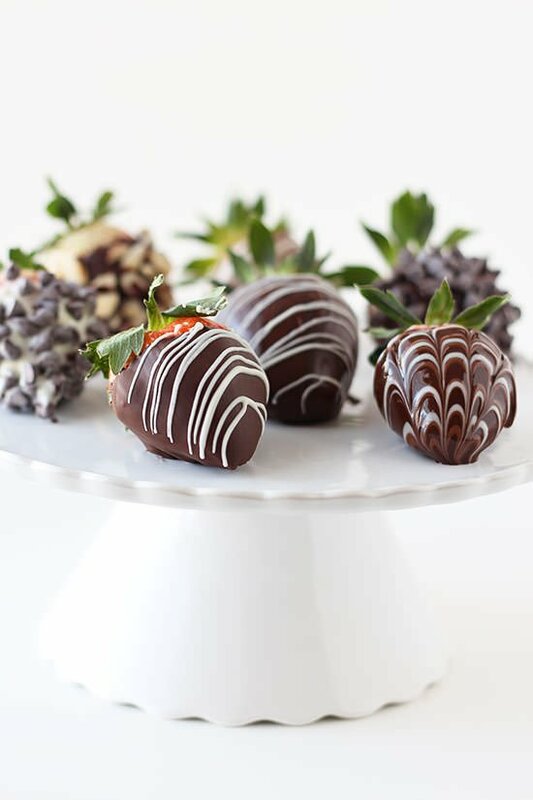 If you make these Chocolate Covered Strawberries, be sure to take a picture and tag it #handletheheat on Instagram so I can see your lovely photos and like and comment on them! Be sure to watch the above video to see how these adorable romantic treats are made step-by-step. I also share some of my favorite tips and tricks and how to decorate them like a pro! Your family will think you bought these at the chocolate shop! They’re not just perfect for Valentine’s Day, but for any anniversary, bridal shower, or anytime you’re craving this perfect flavor combination! Place the semisweet chocolate and 3/4 teaspoon coconut oil in a microwave-safe bowl. Microwave in 30-second bursts, stirring between each burst, until just melted. Be careful not to overheat. Line a rimmed sheet pan with parchment paper or silicone baking mat. 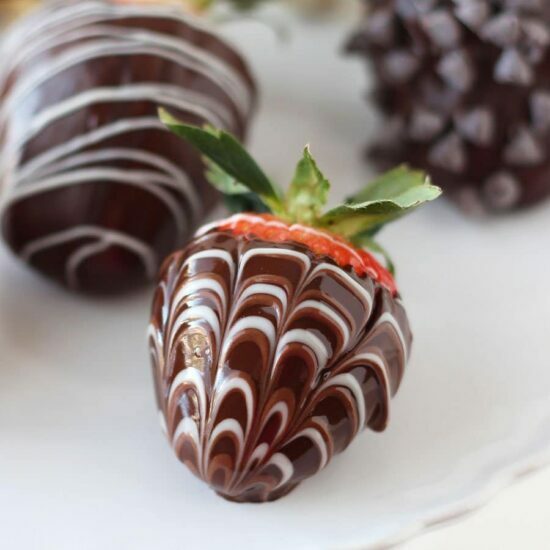 Insert a toothpick into the strawberry’s stem, pushing the leaves upward, and dip into the semisweet chocolate, coating completely. Tapping the toohpick, let the excess chocolate fall back into the bowl. If desired, dip into a shallow bowl of chocolate chips, nuts, or sprinkles. Set the strawberry on the parchment, sliding forward slightly and continue with the remaining strawberries. If the chocolate becomes too cool and firm at any point simply reheat in the microwave. Place the white chocolate and 1/4 teaspoon coconut oil in a microwave-safe bowl. Microwave in 30-second bursts, stirring between each burst, until just melted. Be careful not to overheat. Remove the white chocolate to a ziptop bag and snip a very small hole in one corner. Drizzle the white chocolate over the strawberries. Let the strawberries set before serving, about 30 minutes at room temperature or 15 minutes in the fridge. Wow these come out beautiful and are easy to do. Thanks so much! I just tried these and the mini chocolate chips fell right off after I rolled the dunked berries. Also the white chocolate drizzle turned out horrid lookinh-nothing like yours. I think the white chocolate cooled too fast & I snipped to big a hole? I’m attempting to make these tonight for the boyfriend! Wish me luck! I am making these for my 10 month anniversary with my boyfriend. Give me luck! They look delicious.